Papua New Guinea’s prime minister has announced a ban on all foreign advisers working for his government, saying they make local staff lazy, and they could be spying. The ban, which will take effect on January 1, 2016, will significantly affect the several hundred Australian advisers helping the government as part of a $500 million dollar aid program. 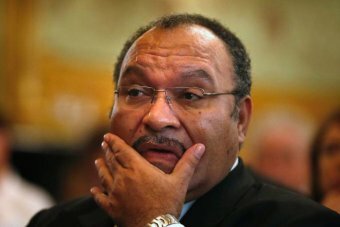 During a session of PNG’s parliament, prime minister Peter O’Neill was asked about the decline of his country’s national intelligence organisation and the possibility foreign advisers were spying on PNG. Mr O’Neill said it was important to rebuild the nation’s spy agency. “We need to revamp it, we need to fund it, work closely with many intelligence agencies around the world and we are working closely with some of the best today,” he said. Mr O’Neill then dropped a bombshell, clearly aimed at Australian advisers working in areas such as policing, law and justice, treasury, planning and health. “We’ve got people working in many of our departments that are working as advisers and it has led to two things,” he said. “One is making our own people quite lazy. They’re not able to take over civil decisions, they are over-dependent on consultants and advisers and sometimes many of those decisions are not … in the best interests of our nation. Mr O’Neill then took aim at one particular group of advisers — the 70-odd Australian Federal Police officers working to improve PNG’s law and order situation. “If we need to recruit experts, it will be recruited by PNG government as an employee of the PNG government,” he said. Australia is the dominant aid partner to PNG and the announcement of a ban comes at a time of tension between the two countries over the Manus Island detention centre and a diplomatic blunder regarding Bougainville. Jenny Haywood-Jones, the Myer Foundation Melanesia program director at the Lowy Institute for International Policy, said she was surprised the collecting of intelligence could be connected to advisers. “Of course governments in the region and in particular in Papua New Guinea know that people that are advisers answerable to the Australian Government are reporting back to the Australian Government but I wouldn’t regard that as intelligence or spying,” she said. Ms Haywood-Jones said a ban on Australian advisers would have a dramatic impact on the aid program throwing staff contracts and long-term development into chaos. The announcement appeared to take Australia’s Department of Foreign Affairs and Trade by surprise.